I’ve just returned from my second trip to the Faroe Islands in the space of twelve months. People constantly ask me what my obsession is with this country and I only have one answer. You get a real sense of peace and quiet there – like nothing I’ve experienced anywhere else in the world. 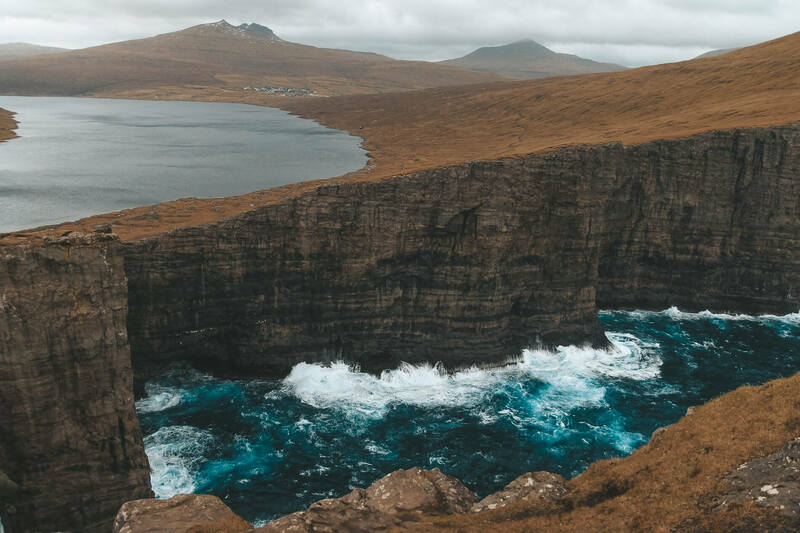 So in the spirit of celebrating this wild, windy and wonderful country, I dedicate today’s post to some interesting facts about the country to keep in mind next time you visit Faroe Islands. After this, I’ll be working on two more articles: a full travel guide and a piece on the island of Kalsoy. The yellow stars are my absolute favourite spots in this country. 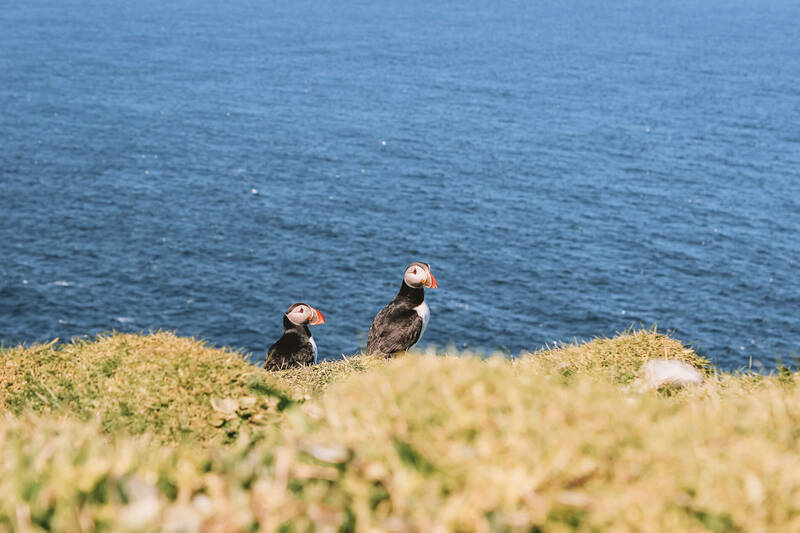 Irish hermit monks could have been the earliest settlers of the Faroe Islands. 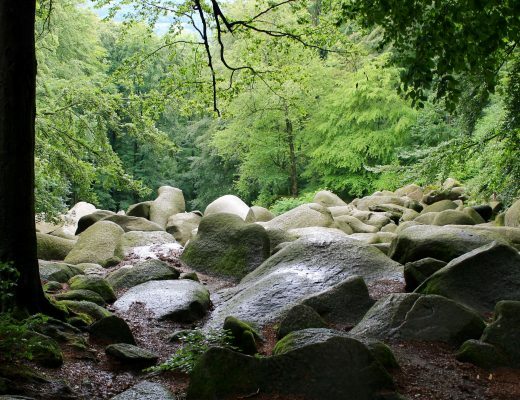 They are said to have arrived in the 6th century, bringing sheep as well as the early Irish language. The majority of archaeological evidence for this early colonisation is likely to have been destroyed by the major Viking invasion somewhere between the 9th and 10th century. The islands were officially converted to Christianity around the year 1000 and became a part of the Kingdom of Norway in 1035. Norwegian rule on the islands continued until 1380, when the islands became part of the dual Denmark–Norway kingdom, under King Olaf II of Denmark. 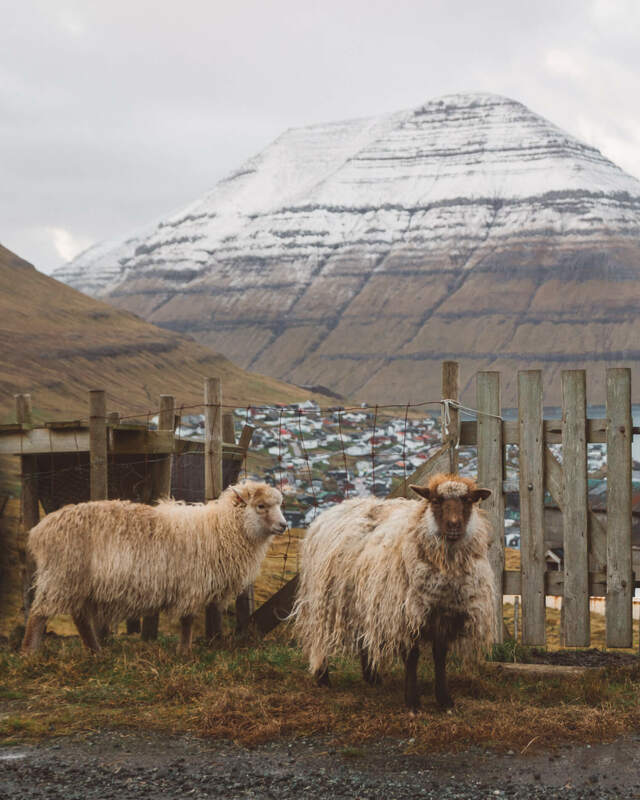 The name ‘Faroe’ could come from the Old Norse word for sheep – basically meaning “islands of sheep”. 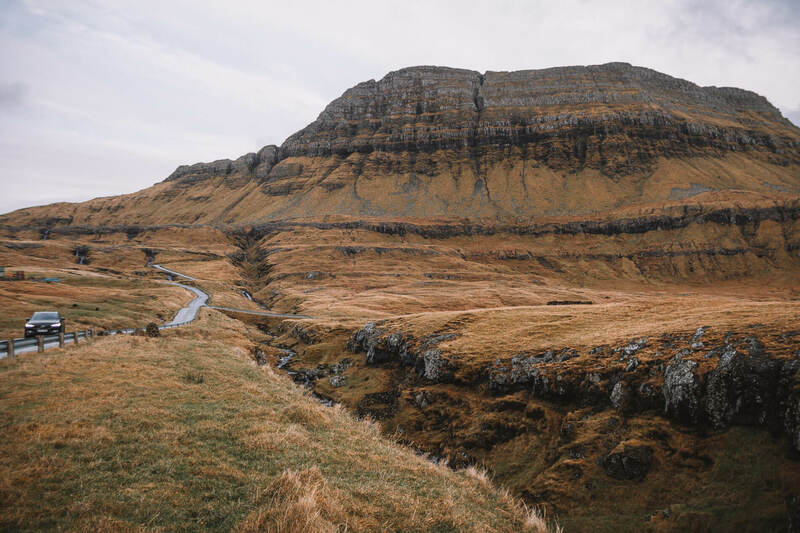 There aren’t any native forests in the Faroe Islands, and only a few planted pockets occur. (Like the forest on the island of Kunoy, pictured below.) 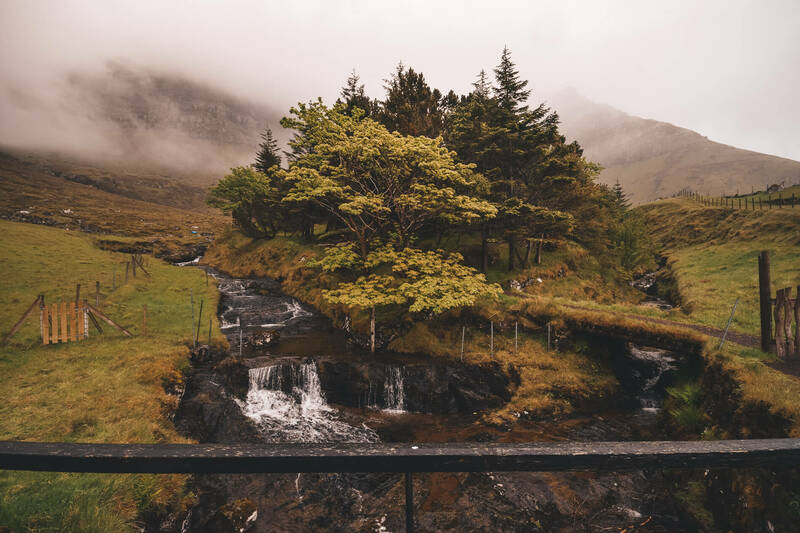 Trunks and branches of certain tree types have been found in the soil, dating back to around 2300BC, which could suggest there were some local strands of birch and hazel trees in the Faroe Islands before human settlement. One resource I found listing Faroe Island facts suggests these mini forests were planted in the early 1900s and another said the 1800s. I also read online that there were trees when the Vikings came, but they chopped them all down for wood and they never grew back. Either way, there are almost no trees here and that’s part of the beauty. 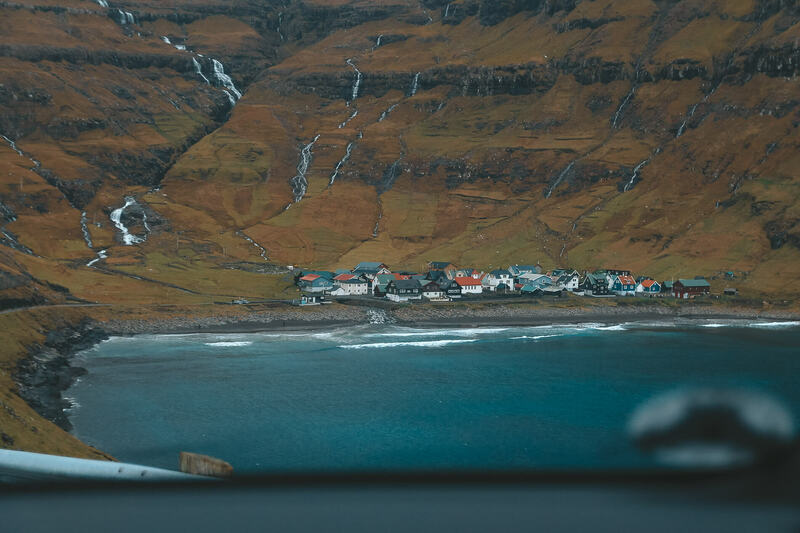 Visit Faroe Islands, and your view is always unobstructed. This forest and a small collection of trees on the island of Kunoy are the only trees I’ve ever seen in the country. Considered to have a ‘fairytale’ landscape, the islands are covered by a blinding and open green (in summer) & auburn ( in winter) grassland that totally carpets the country. 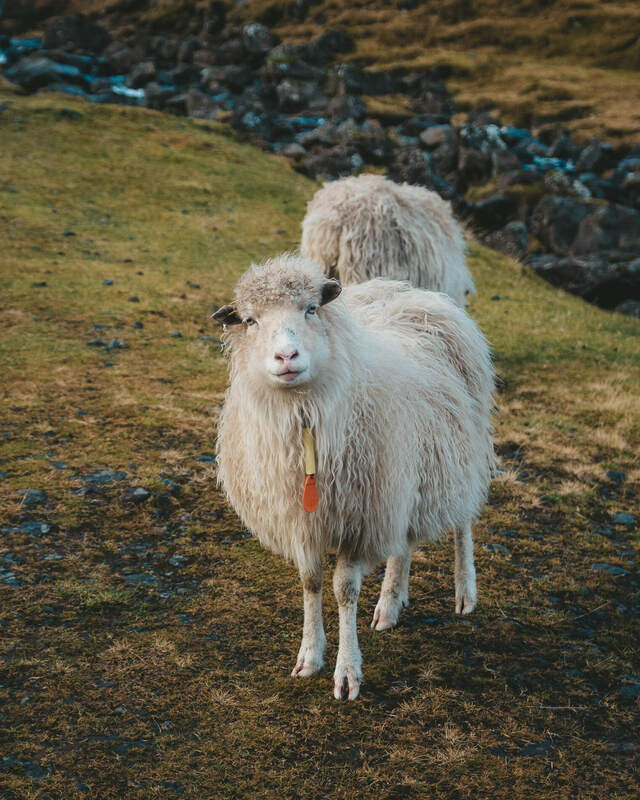 Fact – Visit Faroe Islands and you’ll meet more sheep than peeps. (Population of 50 000.) And there are a lot of sheep; around 80,000. They outnumber the humans on the island by around 30,000. In fact, the animal you’re most likely to encounter here is the Atlantic sheep. Some farmers have started putting reflective straps on their sheep’s legs so they won’t get run over in bad weather and poor visibility. Birdwatching is popular here. 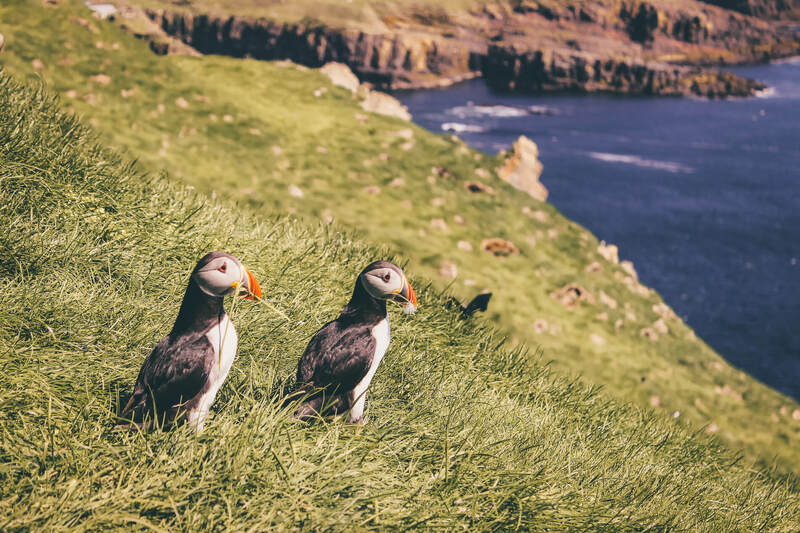 One of the largest Atlantic Puffin colonies is on the island of Mykines. 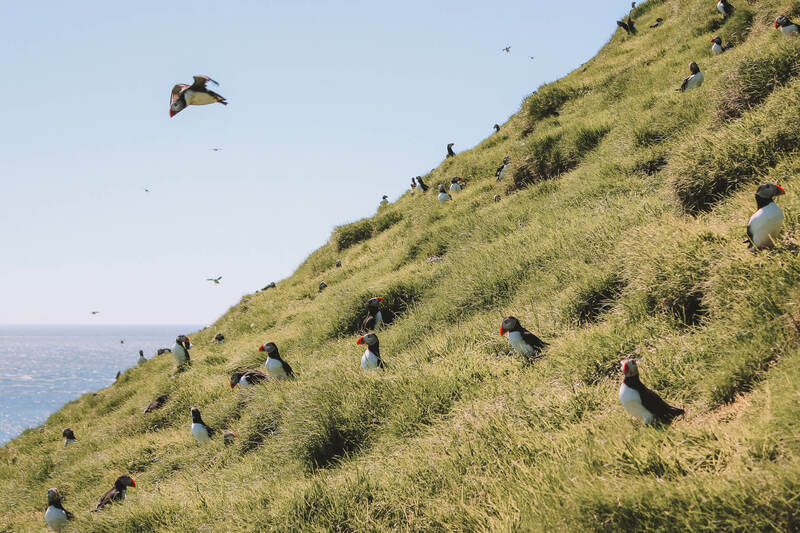 The islands have around 10 times as many puffins as there are humans – plus oystercatchers and other rare birds. 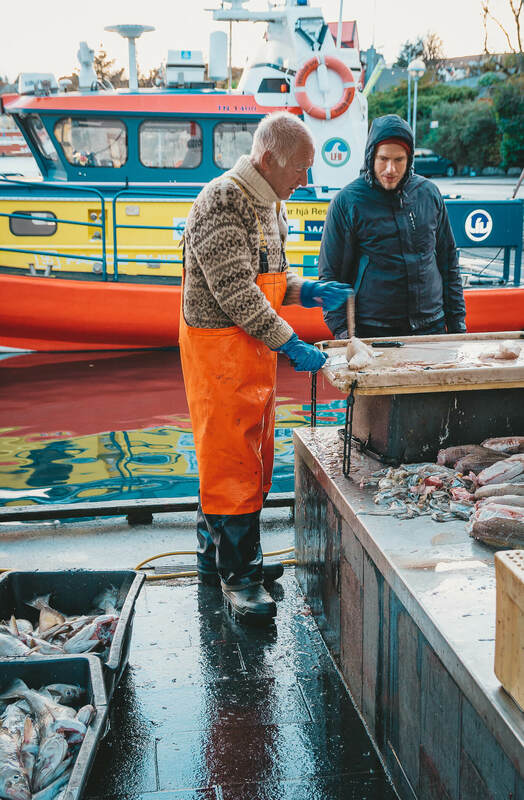 The fishing industry has been the main source of income for the Faroe Islands since 1920. 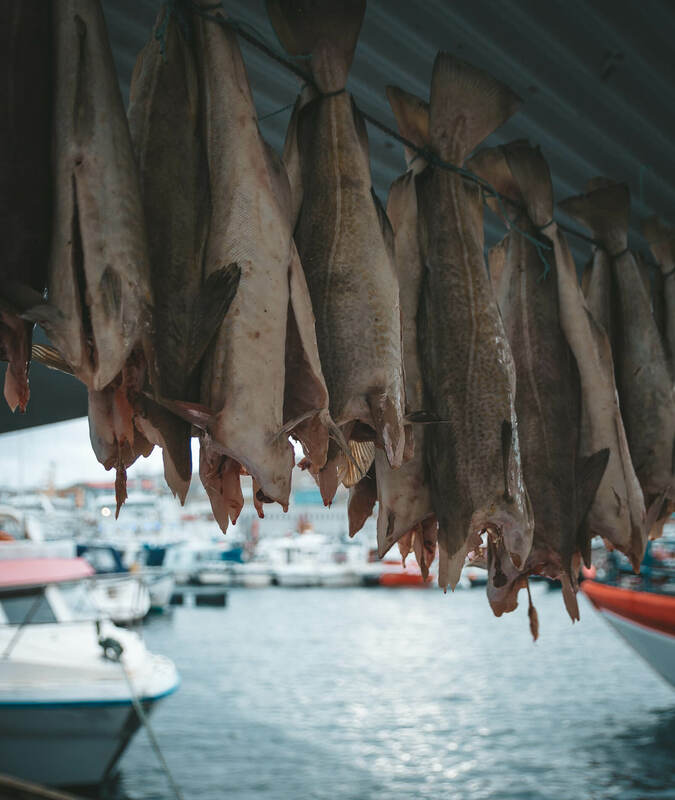 The fishing industry (including farmed fish) represents around 90% of the total export of goods and services. The islands lie northwest of Scotland and halfway between Iceland and Norway. The region is made up of 18 islands roughly in the shape of a spear-head. 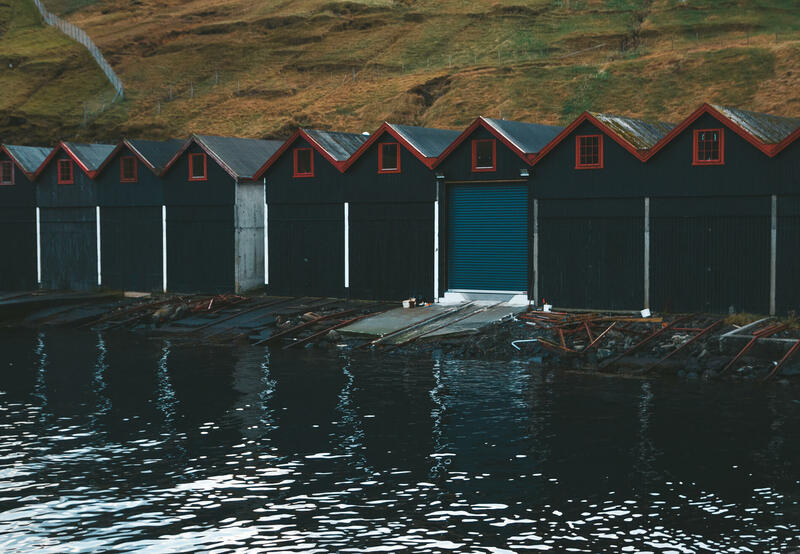 Wherever you are when you visit Faroe Islands, you are never more than five kilometres from the ocean. 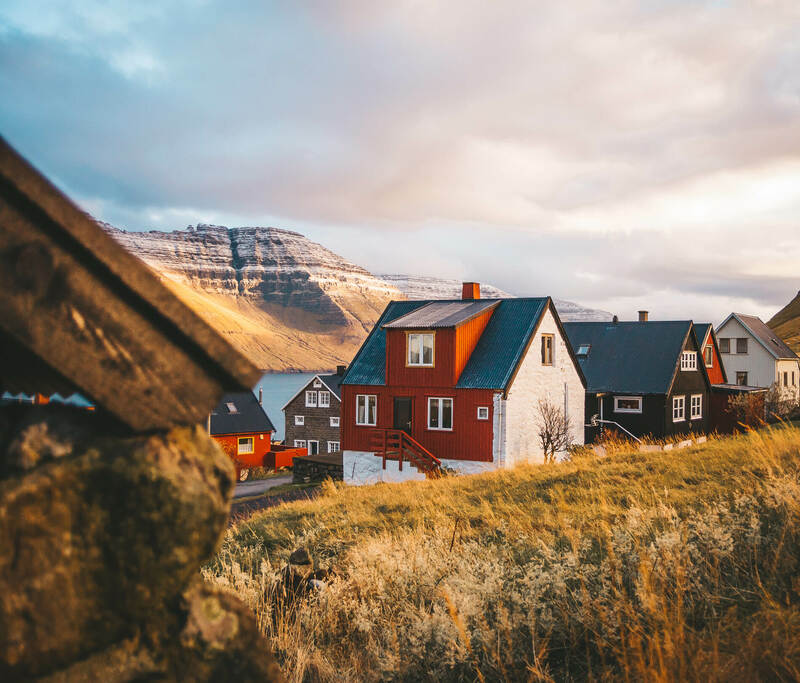 The Faroe Islands are not as cold as you might expect, with fairly mild, average temperatures of 3C in winter and 11C in summer. The weather in the islands changes so quickly that a well-known Faroese saying is ‘If you don’t like the weather, wait five minutes’. 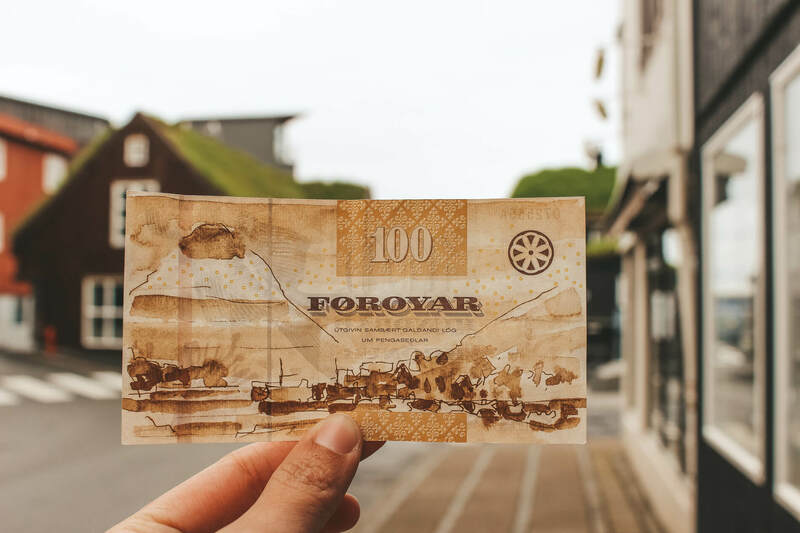 There are two currencies of equal value you’ll use when you visit Faroe Islands: the Faroese Króna and the Danish Krone. While the Faroese government prints its own banknotes, only Danish coins are used. Danish notes are equally acceptable as Faroese notes throughout the country. Up until 1938, school and churches were generally only permitted to use the Danish language. 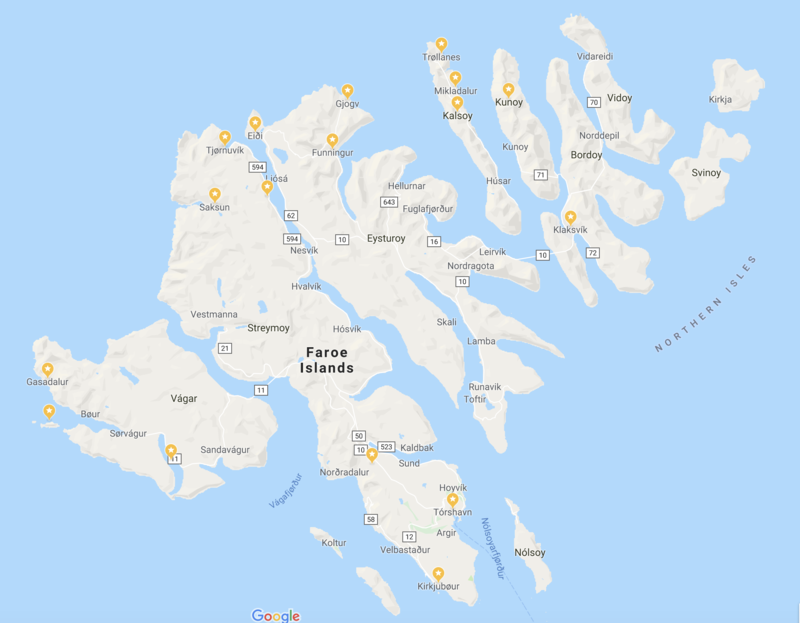 If anyone wanted to use Faroese for church services, they had to ask for permission. 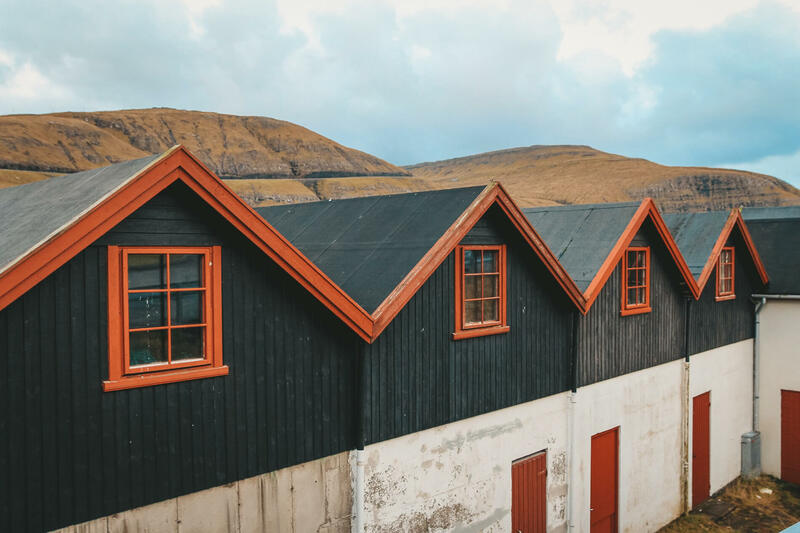 Schools generally used Danish, but in some educational instances, especially when dealing with young children, the Faroese language was allowed. 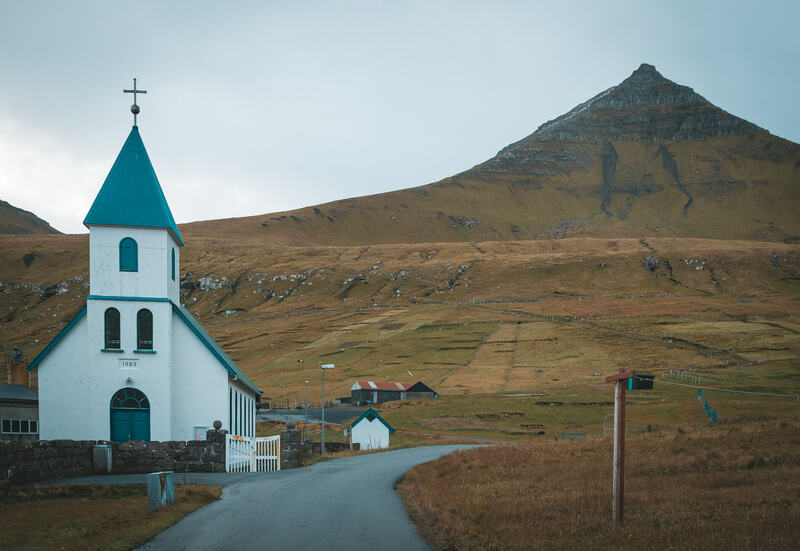 In 1938, the Faroese and Danish languages were made equal in schools and churches. The Faroese language then became the main language in 1948. Faroese comes from Old Norse and is closely related to Icelandic, Norwegian, Danish and Swedish. 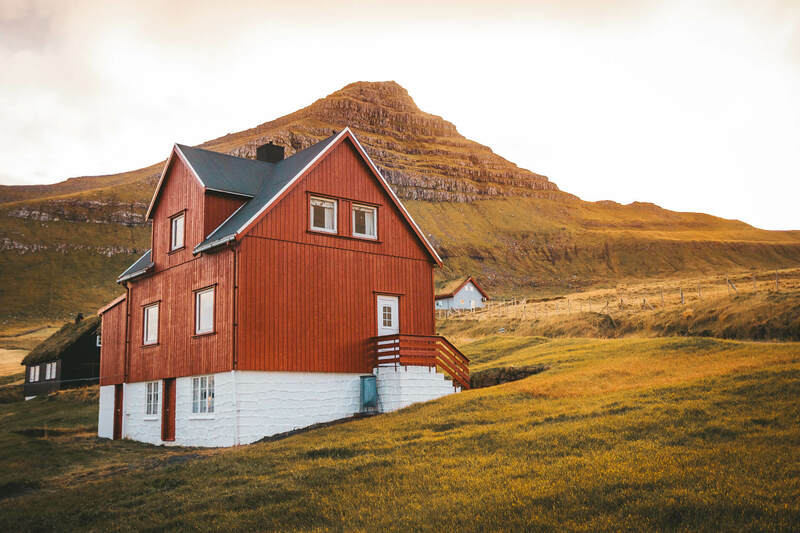 Speakers of those Nordic languages will notice familiar words and grammatical structures in the Faroese language. 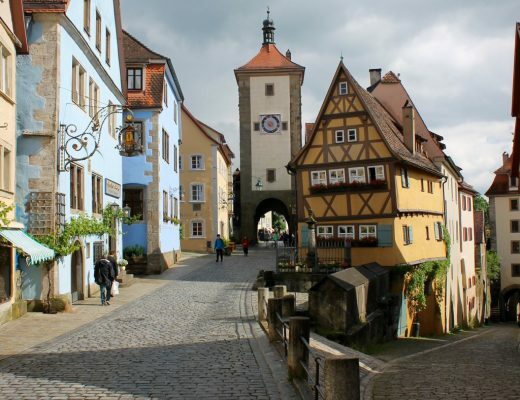 English is also widely spoken, mainly among younger people. 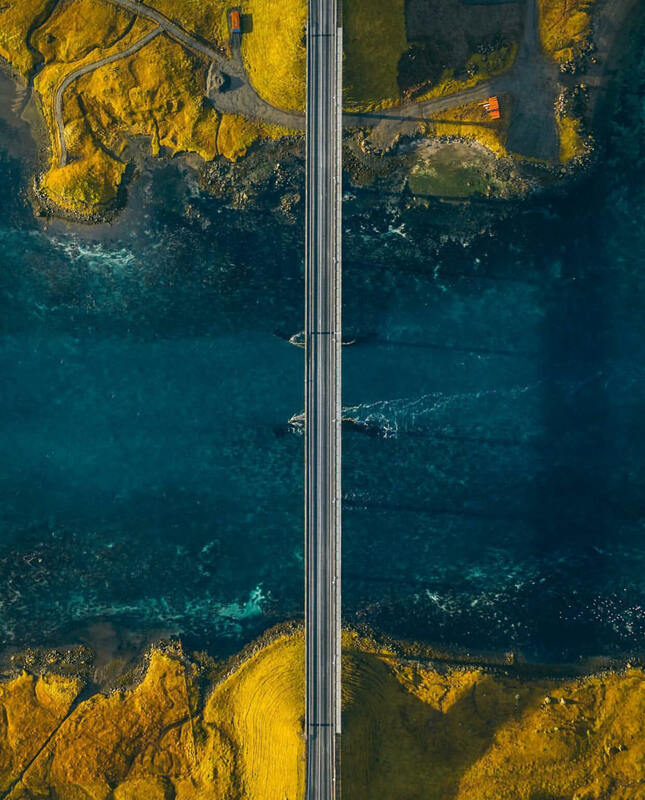 Most of the major islands are connected by undersea tunnels and bridges. The other islands are connected by car ferry. There are three traffic lights in the whole country. 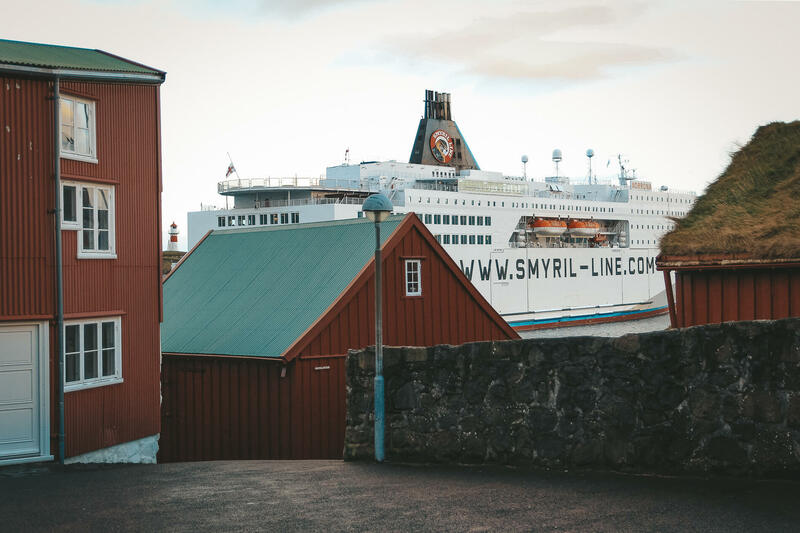 All are in the capital Torshavn and are very close to each other. Over half the country’s electricity is produced from sustainable sources like wind power. 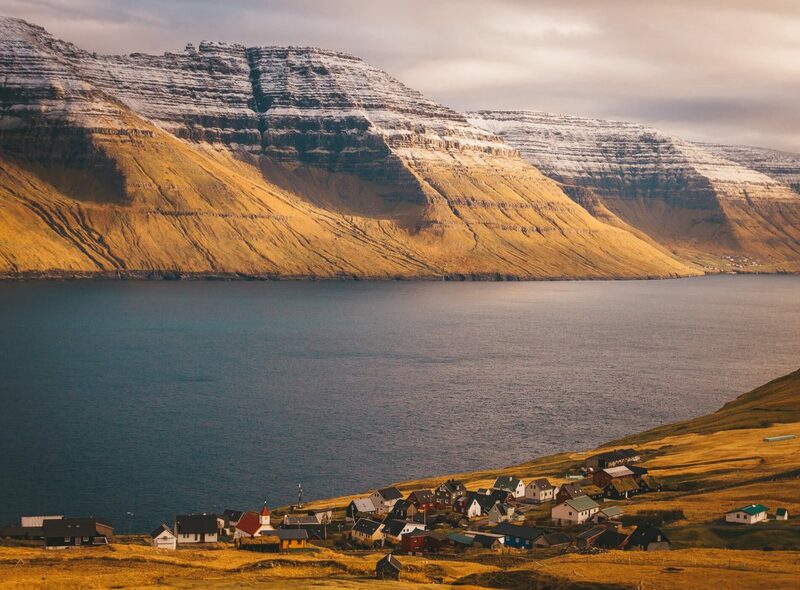 The Faroe Islands has one of the world’s lowest crime rates. 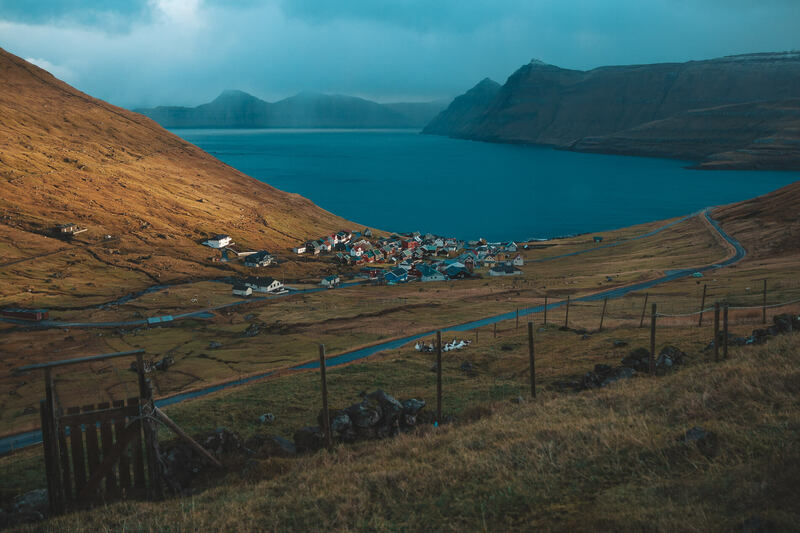 In December of 2012, a Croatian man was convicted of killing a Faroe Island native, which was the first murder conviction on the islands in more than 20 years. Due to the country’s incredibly low crime rate, most people leave their houses and cars unlocked. There’s one small prison above a fjord on the island of Streymoy but it’s only got space for 12 inmates and isn’t a fully fledged jail. Big time offenders are sent to Denmark – the Faroese prison is only for short sentences and small crimes. Fermented lamb, wind-dried fish and sheep’s head. 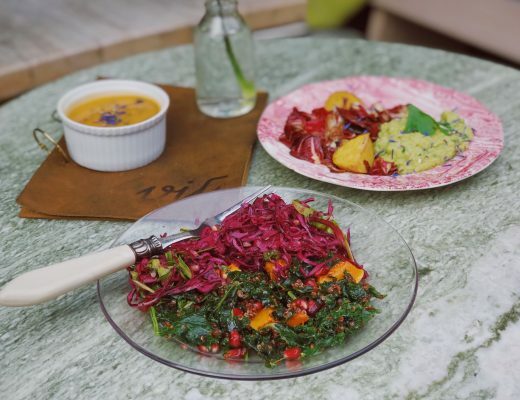 Sound delicious? Most Faroe Islanders think so. Want some further reading material on this beautiful country? 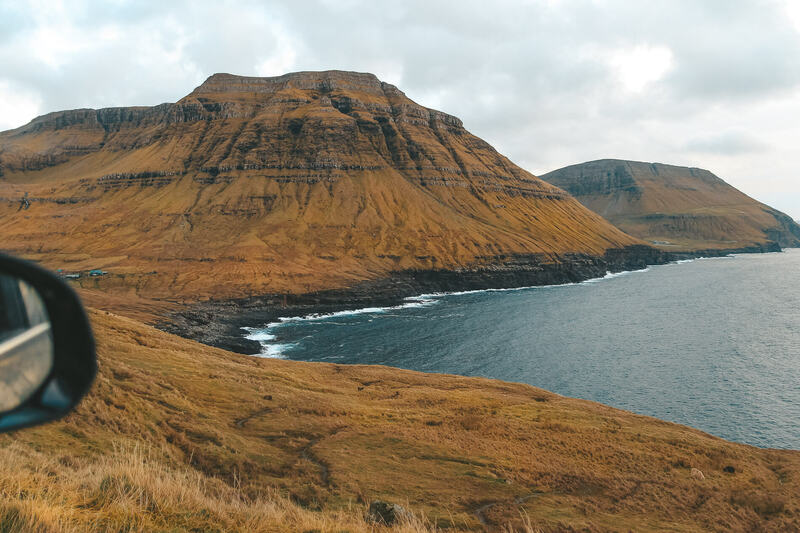 Click on this article to read why the Vikings are said to have found the Faroe Islands second, not first. 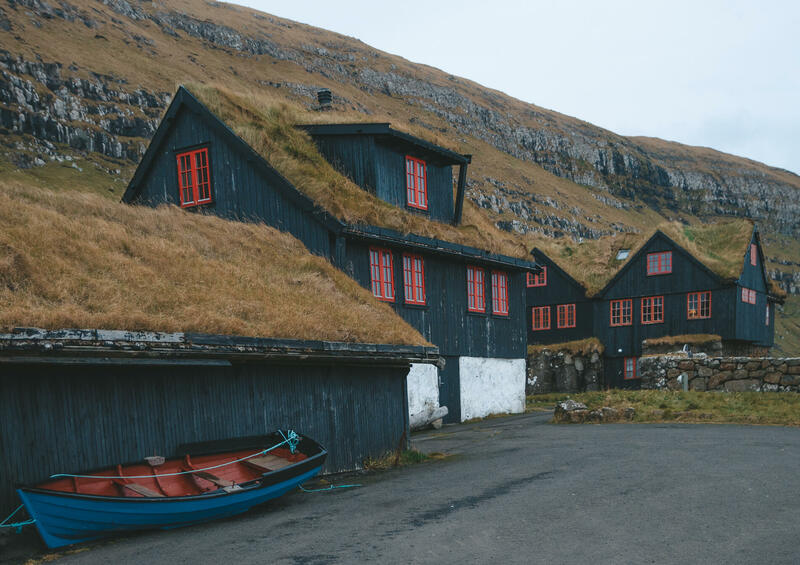 Click here to read some more ‘fast facts’ from the Visit Faroe Islands tourism board. If you like Kaptain Kenny, please do support me. You can follow me here for Instagram, here for Facebook or if you want to be part of my positive travel community, you can join the Team Kaptain Kenny group on Facebook.